Barry Skinstad, a cameraman with Earth Touch News, had an unexpected interaction with a curious whale, while filming in the ocean off the coast of South Africa. After getting into the water, Skinstad noticed a large shape coming swimming towards him from a distance. 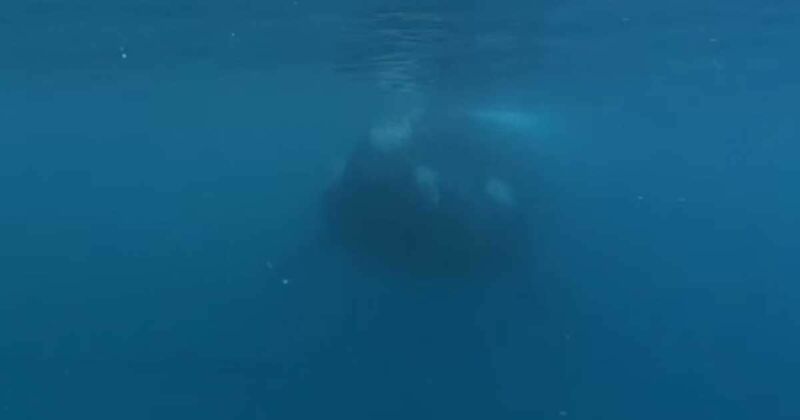 In the video below you'll see that the shape was a large Southern Right Whale, curious to check out what Skinstad was doing. The whale followed as Skinstad dove deeper underwater and resurfaced. "She swam up to me, had a good look around. I think she was as curious of me as what I was of her," Skinstad said. The whale seemed content to follow Skinstad, but also remained aware of his position in the water. "She knew exactly where I was all the time and was very aware of not to hurt me. Every time I moved down her body she would tuck in her fluke or move away," Skinstad said. This type of behavior from the Southern Right Whale is hardly unusual. In fact, whalers referred to this type of whale as "right" because they swim slowly, are easy to approach, and easy to catch. Their gentle, curious nature placed them on the endangered list in 1937, according to Whale and Dolphin Conservation. With years of protection, the Southern Right Whale population has improved, according to Whale and Dolphin Conservation, and if this video is any proof, they are still content to let their curiosity run wild.